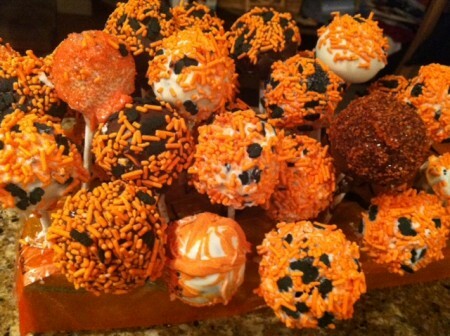 « How NOT to Make Cake Pops! I want to eat them all!!! What a Foofara! Funny too. 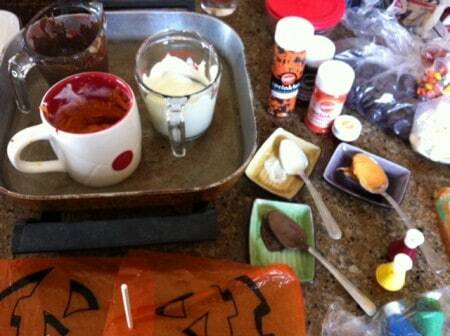 You had the patience to make and decorate cakes in your past too. Everyone should be very impressed! I’m glad they turned out great in the end though! These are so fun to make !! Have you tried again since? will you be doing any for Valentines day??? Thanks Sherry! I just tweeted a pic of your dragon head cake pop. So cool. Are you on twitter? Thanks for checking out my blog and leaving a comment. It was super fun to make these (even though it did take me two days! lol). I won’t have time to make any for Valentine’s Day but hopefully I’ll give it a try again one day. 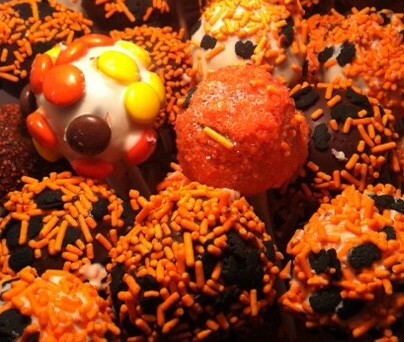 Have you ever made pie pops? 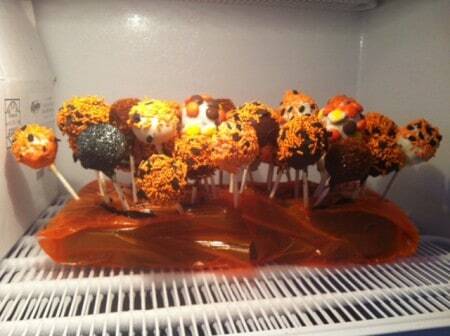 They look so yummy but I wonder how you get them to stay on the stick? AHA!!!! I knew there was a secret! I have banged my head on the counter – taken to binge eating the “extra cake” all over the pops slowly heading south down the stick once they were propped up! Can’t wait to use the “secret” on my next try! Love the blog so glad I found it! Thanks for sharing this!!! I just made my first ever pop cakes…chickens for easter. The first few turned out, but then I just wasted $25 of white chocolate……I didn’t know you couldn’t add certain food colourings and thought i was just burning the chocolate or something….so just googled it and found your page. Hi Michelle, Thanks for commenting! I feel your pain about the chocolate! Check out the comments on Part 2, someone said there is a special kind of food colouring for chocolate, and another lady is making hers with the coloured melts. I didn’t hear back from her to see how it went but it’s certainly somerhing I would experiment with next time. Good look with your Easter chicks! I’m sure they’ll be really cute white. I was so happy when I found this information when I googled “cake pops dripping”. I ended up throwing all of mine away out of frustration. I am trying to make some pops for my sons 2nd birthday party this weekend. I first started out by melting chocolate chips and that didn’t work well. Then I looked up alternataves and found that you can melt cake frosting and then dip the pops in that. Well…easier said than done!! I can’t seam to get the frosting to harden at all and it just runs down the sticks and makes a mess…ahhhh! I even got out a fan and held the pops in front of that to try to get them to dry enough to put them in the rack. Any suggestions on how to “frost” these puppies?? Abby, what kind of icing did you make? Try making some Royal Icing, the kind made with eggwhites, it will harden right away. Good luck!!! 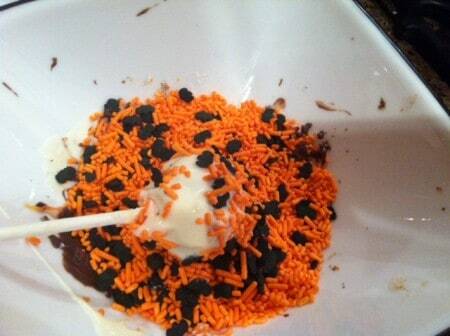 I’m having problems with dipping cake pops. Always my choc cake pops. Doing hello kitty put white chips on waited tell the ears set. Went to dip in white candy melt they fell off stick. 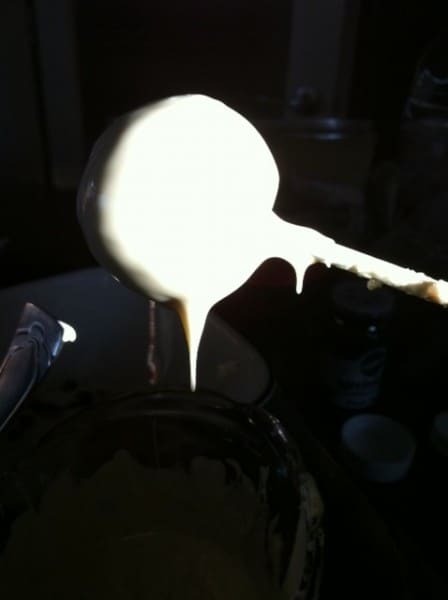 After I inserted stick in cake pop. I put in freezer for a little bit. Then brought back out. Warmed white melts dipped and they fell of stick. I’m a little up set so I just put the remaining in deep freeze. Will try again tomorrow. Tell me what I’m doing wrong. They aren’t very big cake pops. Michelle, before you put the stick in the cake pop, did you dip it in melted chocolate? Then insert the stick while the chocolate is still melty. Put them in the freezer for 20 minutes before dipping. 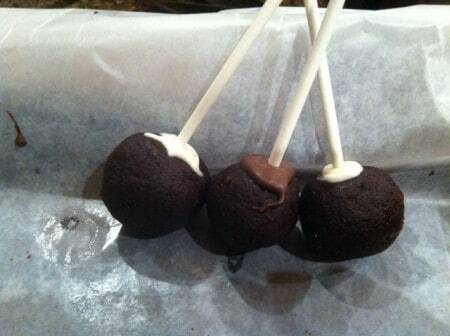 The chocolate will harden on the stick and act as an anchor. It works even better if some of the chocolate forms a seal around the base of the cake where the stick comes out. Good luck!!! Thanks for all the great tips! My daughter loves them an my family is cookies out! Thanks! Just wanted to let you know you can add powder based colouring to chocolate and it doesn’t change the consistency. Also adding vegetable fat to chocolate helps with it being more workable. You do this when your melting the chocolate. But the colour afterwards. Btw great blog. Very helpful. I’m going to use my cake pop machine tomorrow hopfuly it works with GF cake mix.